The Shackle Washer is specially designed to comply with drastically heightened hygiene requirements. Made of stainless steel and synthetics, the shackle washer is mounted on the conveyor system at an angle of 30 degrees. 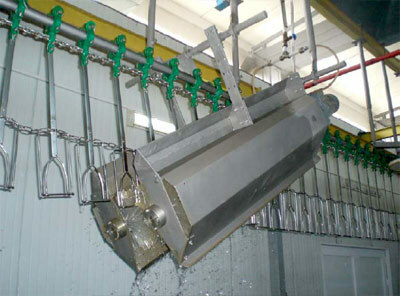 Shackles, trolleys and chain can, with no difficulty, be completely cleaned simultaneously. Each of two long nylon brushes is driven by a separate motor and can be adjusted individually. Cleaning water is supplied separately to each brush and this increases cleaning efficiency. If required, a disinfection metering device can be connected to the water inlet. The brushes are covered externally with a stainless steel case to effectively prevent water splashing.